Do you remember what Christmas felt like when you were a kid? For me the holiday season was filled with sledding on the snow covered hill behind our house, building snowmen, staying up late and having a ton of fun. Are you wondering how to get “back to that” and enjoy a stress free holiday? Who say’s the Holidays are supposed to be stressful? With the gift-giving, the baking, the decorations and the parties, the holidays can feel more like work than a vacation but, we have the perfect solution to help you relax and enjoy every bit of the holidays with the ones that matter, your family. Cozy up by the fire- Where I live it gets cold… dang cold and one of my favourite ways to relax during the winter is to curl up by the fire and read a book to my kids or lose myself in my knitting. unplug from technology It’s so easy to get wrapped up in what’s next on our calendars or what everyone else is doing that we forget to really enjoy what’s around us, our family, friends and the spirit of the season. So take some time and unplug. Be there, be present and enjoy the season! watch a Christmas movie Curl up on the sofa with a warm blanket and a bowl of popcorn. I don’t know about you but I have so many favourite Christmas movies that we could be entertained well into the new year. 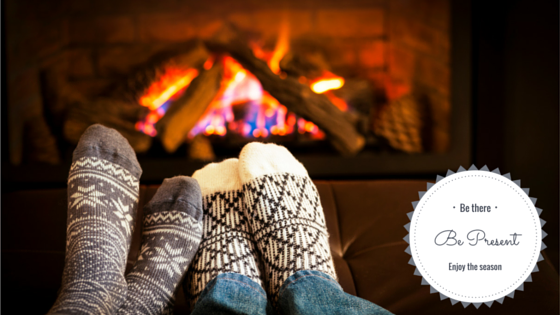 It’s a great way to relax and enjoy spending time with your friends and family. Crank the Christmas music Around here we don’t start listening to Christmas music until after Remembrance Day. I like to turn it on while folding some laundry or straightening up the house. It helps put me in the holiday spirit and reminds me what the season is all about. It’s a great way to enjoy doing tasks like wrapping gifts or working on Christmas cards. bake cookies for your neighbours Some of my fondest memories as a child were made in the kitchen so get the kids involved. Who cares if the flour spills on the floor just ignore the mess and focus on the laughter instead! You might be surprised to see just how appreciated a plate of warm cookies can be. Follow Heather Lawrence’s board Christmas Baking Ideas on Pinterest. What are some ways that you take a break and enjoy the stress free holiday season? I definitely take some time away from my devices! And listening to Christmas music is my favorite! I love these tips! Christmas movies are my favorite! I LOVE to watch Christmas movies. That is one thing that I absolutely look forward to with the approaching Christmas season. That and snuggling with loved ones near the fire. Great post! I wish we had a fireplace! I grew up with one and you’re right, it makes it so much cozier. I’m hoping our next house will have one but in the meantime, we do all the other things and it makes for an amazing holiday season! Great tips, I especially love the one about baking for the neighbors. It is hard to be stressed when you are doing good! These are great tips! We like to relax and watch Christmas movies. He despises the movie, but hey it’s a childhood memory my sister and I have for years; to yearly watch A Christmas Story for as long as possible on Christmas Eve. My husband and I like to bake cookies with our kids for the holidays. Thanks for sharing the great tips! We like to cuddle up in the living room with the lights turned down, pop some fresh popcorn and watch movies to relax during the holidays. Such fun and great tips! I really hope to do them all – especially unplug! I’ve been working hard all November so we can spend December with less on our to-do lists & more time together. I feel really good about it! Those are all great ideas! Why does such a fun time of year always bring stress? Oh the irony! These are all great tips. I especially love the one about unplugging technology. I’ll have to try that one night this holiday season. I’ve found that listening to Christmas music tend to destress me, you really can’t be grumpy with Christmas music on unless you’re the Grinch. I love the holidays but yes stress can be a big thing. Thank you for the awesome tips to help. I’d love to take advantage of some of these. And how fun to bake cookies for the neighbors! Unplugging is the best advice of all! The holiday season can be so challenging and so stressful. Funny how listening to Christmas music just calms me right down. The holidays can be stressful and blaring Silver Bells just gives me the moment of peace I need once in awhile! We will be unplugging from our phones and computers and watching holiday movies all day long. Spending quality time with family is super important. 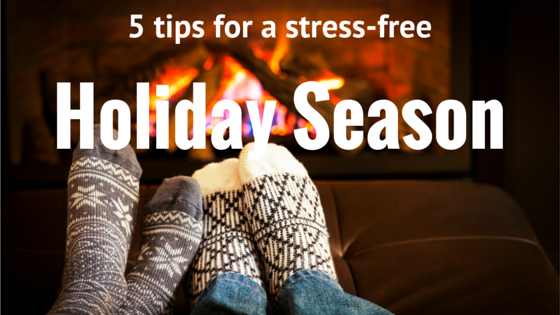 Great ways to reduce holiday stress. I love listening to Christmas music.. Friday after Thanksgiving I start listening to Christmas tunes. I found that being organized really helps my stress. Great tips. I have to add – LISTS! Keeping lists of everything helps me stay less stressed! Love watching Christmas movies even right now! Setting my Tivo to record them so we can watch them over and over this season! Love these tips, especially baking the cookies for your neighbors! Such a great idea! I definitely need to step away from technology for a few days at a time. It will be nice to get the fire place going and just sit down with a good book. One of my favorite pastimes during the holidays is to listen to Christmas music and watch our favorite Christmas movies! It’s festive and relaxing and I can do it while I’m getting stuff accomplished and ready for our celebrations. I love doing that too. I think I watch the classic Charlie Brown Christmas movie every year. I think these are all great ideas, but unplugging is definitely #1. I am a Christmas movie and music fan, too! These are great tips, especially the first. My kids are growing up so fast, I need to remember to unplug and enjoy the season with them. Unplugging is a great tip! It can be so easy to get caught up in what is going on online, or competing with the perfect holidays you see on instagram. I bake Christmas cookies with my mom, niece and nephew while listening to Christmas music. It’s one of my favorite traditions! I will do all of these things! Christmas movies are my favorite. And sometimes it’s really hard for me to unplug and just go sit by the fire. I’m going to do it. And my neighbors do need cookies, actually!